Charity - Hello, I'm Haley Landsman. I have worked with are listed below. On July 15, 2010 the Muscular Dystrophy Association hosted their annual MDA Lock-Up. When one of my friends put out a 'warrant for my arrest' I set my bail at $500. With the help of friends and family I raised over $650 to help Jerry's Kids. Money from the event helped provide medical equipment, clinic visits, support groups and MDA Summer Camp for families served by the Milwaukee area's Muscular Dystrophy Association. On Thursday, July 14, 2011 I will get arrested again! 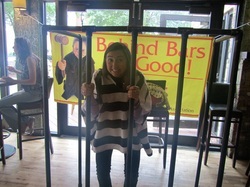 Please consider donating to my bail! #MKEBowling is an event that I planned which took place on May 16, 2010. It was promoted via word of mouth and various forms of social media including Weebly, Eventbrite, Twitter, Facebook, Twtvite and a pre-event Twtvite. The event benefited the Multiple Sclerosis Society of Wisconsin. Over 60 active members of the Milwaukee community came together to bowl and to fight MS. Leading up to the event, many partnerships were formed with area businesses to provide support and over 30 raffle items. The event garnered a $925. Throughout college, my sorority hosted various events to raise money for the Alpha Phi Foundation and the American Heart Association. Events included an annual Red Dress Gala and Silent Auction, an annual Women's Red Dress Luncheon and Alpha Phiesta, an all you can eat taco event. In 2006, my sophomore year of college, I created an all-campus community event called Cardiac Arrest. Cardiac Arrest is an annual Jail 'N Bail event on Marquette's campus each springtime. Various campus and community leaders come together to be 'arrested' by the A-Phi-P-D to raise 'bail'. Raising approximately $1000 per year, this campus favorite brings people together to fight heart disease. In March of 2008 the McDonald's All-American basketball games came to Milwaukee. Each year, the McDonald's All-American High School Basketball games select promising players from around the country to come together for a good game and a good cause. To make this event a success, national companies including Topps and The Rock, cam and Laughlin Constible and individuals The 2008 games raised over $600,000 for Ronald McDonald House Charities. As a regular contributing member of Radio Milwaukee, I fully support the mission of this local radio station. It brings people together, supports the Milwaukee community and introduces people to fantastic music. This summer, Newaukee, 88Nine Radio Milwaukee and the Urban Ecology Center (UEC) came together to host 'The New Ecology of Sound'. This event raised money for these great organizations and I was happy to be a part of the planning team. The event featured the wonderful space and offerings of the UEC and music by local artists as well as 88Nine Disk Jockeys. Kris Keiker, one of the founding members of Newaukee fell ill in the Spring of 2010. When Keiker went into a coma the rest of the planning team came together in full force. We visited him in the hospital, wrote letters to his family, kept our members informed and eventually showed our support at his funeral. At our Iron Horse Yard event we hosted a fundraiser to help his family cover his medical bills. With the help of various Milwaukee companies' donations and attendees who participated in the raffle, we raised $900 for the Keiker family. @TeecycleTim's home was flooded this July and the Milwaukee Social Media community came together to help Brew City. The Brew City Runraiser was organized by @Trenni and @MJWizzy and I was thrilled to be able to help on the day of the event, September 8, 2010. The event raised at least $700 for one of Tim's neighbors and the American Red Cross through runner registration and a raffle consisting of prizes from various Milwaukee companies. Monthly contributions are pulled from my account by St. Jude. Receiving letters with photos of St. Jude patients warms my heart and gives me a sense of purpose. A lot of people say that they would donate to charity if they won the lottery but most people will never win. Make a difference in a small way and our contributions will add up.